Mel King: You Have a Right to Revolution! Friday, May 1st, 2009, 8:00 p.m. till late Join our friends from the Committee In Solidarity with the People of El Salvador (CISPES) in celebrating the elections recently held in El Salvador. Friday, December 12, 2008, 8:00 p.m. Inviting women of all ages to come celebrate the last full moon of 2008 with Live Music, Art, Story-telling, Dance, Potluck and much more. Drum Circle Celebrates 2nd Anniversary! 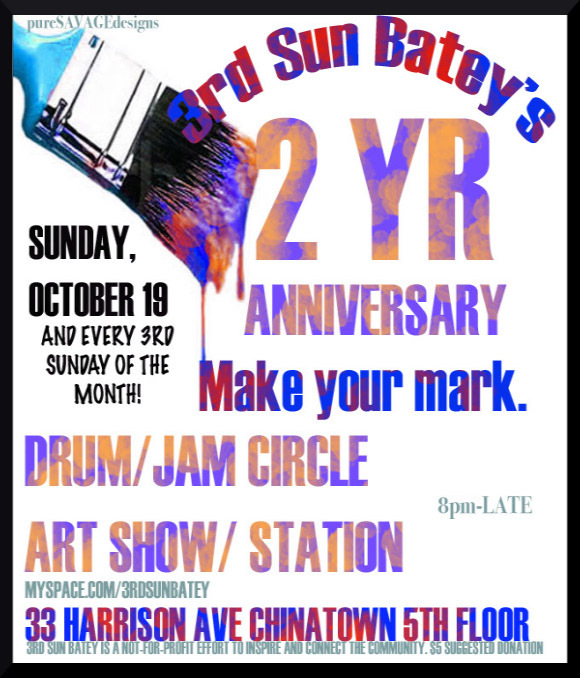 Sunday, October 19, 2008, 8:00 p.m. Join host Taina Vargas for a celebration of the 2nd year of the 3rd Sunday Batey. The program starts at 8:00 p.m. and runs till late. The night will feature: an art exhibit by local activists & visual artists, emcees & poets, drummers & musicians, dancers, a potluck dinner and much more. A $5 donation is suggested.